Landowners and managers now have the ability to create deer management plans and collect and share data more easily to manage and monitor deer population impacts across the landscape, helping to improve the environmental condition of woodlands. myForest is a web-based management tool for woodland owners and managers. Launched eight years ago it is now used by over 3,500 owners and managers covering an area of almost 56,000ha. It has a directory of almost 800 woodland and wood-based businesses. myForest users are able to use the system to create a Deer Management Plan, using the Deer Initiative’s template. Creating a Deer Management Plan is an important step towards managing deer populations. In addition, myForest allows annual monitoring data to be stored, including cull numbers and deer impact data, from which users can automatically generate reports. To aid landscape-scale management, users can choose to share their information with local DI Deer Liaison Officers which helps them monitor deer impacts across landscapes allowing assistance to be prioritised. 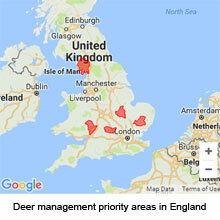 Although this deer management functionality has been specifically developed for use in the five priority areas it is hoped that it will be useful to users across England, and indeed in Scotland and Wales.